I hope you’ll be able to forgive me. I meant to tell you about these much sooner, in time for you to even whip up a batch for Easter should you have been so inclined. But first I was struck down for four days with a cold, and then due to my negligence in note-taking had to re-test the recipe, at which point I found my Turkish market was out of the cheese I needed and didn’t get it back for nearly a week. How’s that for excuses? Actually, the only issue in bringing it to you now instead of ten days ago is that it is technically an Easter recipe, but if you, like me, are capable of looking past that tiny little detail, I think we’ll be home free. And anyway, this is just too good to be relegated to one holiday a year, as I’m sure you’ll soon agree. I have a particular fascination with Easter traditions around the world. I suppose this is because I come from a family that’s pretty lacking in the Easter-tradition department. Actually you could say most Americans are lacking in this department; apart from egg-decorating, egg hunts and speculations about the mythical Easter Bunny (and let’s not forget copious amounts of cheap chocolate, in particular these abominations to good taste that I coveted for years until I finally managed to try one! ), I can’t think of any Easter activities that unify the nation. Feasting and family are certainly not associated with it like they are with, say, Thanksgiving and Christmas, and while I know that a lot of people go to church, being of a secular persuasion we never did. In all honesty I never really minded our lack of traditions, or even thought much about it – that is, until I started getting to know people for whom Easter means so much more than colored eggs and chocolate. Europeans, in general, are much more serious about Easter than Americans. The Spanish take a whole week off and stage processions and parades in funny costumes. The Italians do much of the same, and feast like it’s going out of style. The British and Irish take a four-day weekend and find the whole thing serious enough to even close their pubs. The Germans light Osterfeuer, enormous community bonfires complete with the requisite sausages and beer. The Eastern Europeans have a whole litany of religious and culinary traditions that include things like midnight masses, picnics, paskha and kulich. The Greeks are also big Easter-celebrators, as I discovered when I lived with many of them during my years in student accommodation in Edinburgh. At times it seemed they spent all year waiting for Easter. To them Easter wasn’t just any run-of-the-mill important holiday, it was the important holiday. In fact many of them would skip going home at Christmas (when the university was closed for three weeks) so they could do so at Easter, when all they might be able to squeeze out of their schedule was a long weekend. It was that important. One of the Greeks I lived with was a Greek-Cypriot named Eleni, who was in Edinburgh doing a one-year master’s degree in archaeology. Unfortunately her schedule meant that she had some big deadlines she couldn’t miss right around Easter, and as much as she wanted to, she couldn’t go home. She was devastated. Luckily her family back on Cyprus missed her as much as she missed them, and in an effort to console her mailed her a big package chock-full of food. I remember watching her rifle through it in our communal kitchen, squealing with delight at each item she unpacked. The centerpiece of the package, the thing that sent Eleni over the moon with happiness, was a big tupperware container of homemade sesame-covered pastries from her grandmother. Before I could even ask what they were Eleni was excitedly passing them out, telling us this was what everyone ate for Easter in Cyprus. I don’t know what I expected typical Cypriot Easter pastries to be (probably something extremely sweet), but certainly nothing like what they actually were: a buttery, brioche-like crust cradling a filling of salty cheese, mint and raisins. Pungent, herbal, a tiny bit sweet, and fragrant with some mystery spice, they were hands-down the best edible Easter tradition I’d ever tasted. But somehow in all the commotion I forgot to ask Eleni what they were called, and by the time I thought to do so she was long gone and we had lost touch. I never forgot about those pastries, though, and always had in the back of my mind that someday I would have to go to Cyprus at Easter and track them down. Of course, staring me in the face was another alternative too obvious to have even occurred to me: look them up online. Doh! Of course, that’s what I should have done all along, but it took running across a photo of them somewhere to realize I could just plug ‘Cyprus’, ‘Easter’, ‘pastry’ and ‘cheese’ into google and there I would have all the info I ever wanted on them. And in the end that was all it took for me to learn that they’re called flaounes, and that locating a couple of unusual ingredients was all that stood between me and pulling a batch of them out of my very own oven. These are some pretty special pastries. There’s a lot going on in them, but everything contributes an important aspect of their personality: buttery crust, nutty sesame, salty cheese, cooling mint, sweet raisins, and the haunting aromas of the spices mastic and mahlab. Their texture is also something unique, since when they bake the dough and leavened filling slightly meld, creating a kind of gradual spectrum of crisp to gooey. I can certainly see why Cypriots are proud to call these their own, and why most recipes you find online list ingredients in the kilos and the output in the dozens. This is a more modest adaptation, which you’ll probably find more useful if you don’t have an extended family the size of a small army. They do, I’m happy to report, come remarkably close to the flaounes I tasted all those years ago in Edinburgh, though there is one ingredient missing that I can’t fail to notice. 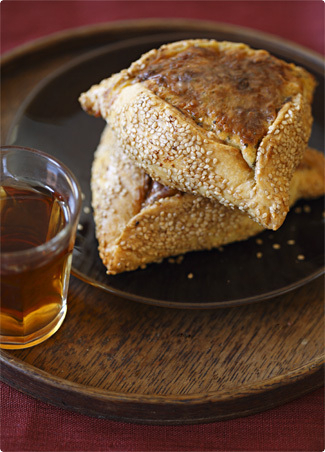 That would be the unabashed joy these pastries give Cypriots like Eleni, who take one bite and instantly relive a lifetime of jubilant family gatherings, laden holiday tables, and the warm, comforting scent of bread and cheese baking in a grandmother’s kitchen. But luckily, they’re delicious even without it. There are a couple of ingredients here you might need to put some effort into finding. Mahleb or mahlab is the ground dried pits of a wild Mediterranean cherry; I’d describe its scent as sort of a cross between almond and cinnamon. Mastic is the dried resin of a kind of shrub, and has, for lack of a better word, a kind of resiny flavor. Both of these spices are quite common in Greek and Middle Eastern cuisine, so start your search for them in shops that sell food from these places. If you can’t find either, rather than try to substitute, just leave them out. There are enough other flavors here to take up the slack. The cheese is a little trickier. You want to aim for something quite salty and pungent, preferably made from sheep’s milk, to make up at least half the weight. If you can get imported Cypriot halloumi, you can use exclusively this; it’s salty but not overly so*, and usually made with a blend of sheep and goat’s milk. You’ll know it by its flecks of mint on the surface and uneven shape, like it was folded in half before being packaged (which it was). Don’t, however, use Greek- or Turkish-made halloumi which is made from cow’s milk only; it’s unbearably salty and rubbery in texture, and provides little in the way of flavor. If you can’t get real halloumi, you can try another sheep’s milk cheese like a middle-aged pecorino, or try a blend of cheeses, perhaps mixing a milder white cheese like kashkavali, gouda or even Monterey Jack with an equal weight of something strong and salty, such as kefalotiri, pecorino romano, or manchego viejo. I’ve even seen recipes that combine up to five kinds of cheese, so feel free to experiment. One final thing: the raisins are a matter of debate – some swear by them, others detest them. I’m in the former camp. I’m normally not a huge raisin fan but these are barely detectable, and just there to provide the occasional subtle burst of sweetness. In a large bowl mix the flour, yeast, salt, mastic, mahleb, and sugar. In a separate bowl, whisk together the eggs, milk and butter and add this to the flour. Add as much water as needed to get a soft but kneadable dough. If it’s too sticky to knead, add additional flour by the spoonful until you can knead it with clean hands without it sticking to your fingers. Turn the dough out onto a lightly oiled surface and knead until the dough is smooth and springy, about 5 minutes. Form the dough into a ball. Wash out the bowl, pour about a teaspoon of oil into the bottom, and put the dough in, rolling it around to coat it with the oil. Cover the bowl with a cloth and leave for about an hour, or until doubled in size. Fold the dough over itself a couple of times to deflate, cover the bowl with plastic wrap and refrigerate for at least 2 hours, or up to 24. Meanwhile, mix all the filling ingredients except the baking powder and set aside. If refrigerating the dough overnight, cover and refrigerate the filling too. Spread the sesame seeds on a plate. The dough is easiest to handle when it’s cold, so divide it in half and keep the half you’re not working with covered in the fridge. On a lightly oiled work surface, and using a lightly oiled rolling pin, roll the other half to a thickness of 1/4-inch. Using a bowl as a guide, cut as many 6-inch circles from the dough as you can. Combine the scraps, re-roll and cut out more circles. Repeat until you’ve used all the dough. Gently pick up the circles and press one side into the sesame seeds. Brush off any loose seeds. Place the circles back on your worktop, sesame-side down. Stir the baking powder into the cheese mixture. Heap 2-3 tablespoons in the center of each dough circle, spreading it slightly but leaving at least an inch (2.5cm) border all around. Brush some beaten egg around the edge of the dough and fold three of the sides to form a triangle shape (see pictures below). Using a fork, press the corners together to join. 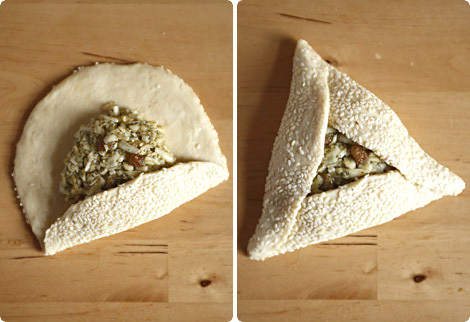 Place the flaounes on parchment-lined baking sheets, spacing them widely so they have room to expand. Let them rise while you prepare the second batch of flaounes, about 30-40 minutes. About 20 minutes before you begin baking, preheat the oven to 375F/190C. Just before baking, brush the outside of the flaounes with beaten egg. Bake them in batches for 30-40 minutes or until golden brown. Cool on a rack and enjoy warm or at room temperature. Freeze what you won’t be able to eat within 3 days. *That said, even real halloumi varies in saltiness. If you find yours is extremely salty (i.e. too salty to eat on its own), cut it in slices and soak it in cold water for a couple of hours, changing the water every half an hour, until the salt is reduced to more palatable levels. They look absolutely delicious. I’ve always been happy to extend Easter. Why not? always look at the lovely baskets of eggs and such posted by friends after the fact and this year I am more in the spirit now than I was before. It also gets me in the mood to get into my favorite neighborhood middle eastern shop. The owner actually shakes my hand when he sees me on the street. I haven’t been in weeks. Thanks for this inspiring post. Wow, these look like hamantaschen! It doesn’t have to be easter to enjoy the best part of it… which is FOOD! so let’s eat! I haven’t had these in ages! Thanks a bunch! Hi SweetieSince you’ve included the fact that these can be shipped internationally and still retain quality, when might we expect some?Love, Momp.s. Happy Easter! Wow. That looks very new to my eyes! I’ve never seen a dish shaped like that. But this is a very intersting dish. I should try this today! Thanks for posting. this sounds so good! I love cheese in all varieties and quantities. cheese and pastry, this does not get any better… have to try them. thank you for sharing the story! Wow, these look fabulous!! Why is it every time I come here I find something new and delicious? How do you do it?? This flaounes look delicious and I’m quite sure that I’ll manage to find the ingredients at some ethnic shop… I just have to! Can’t wait to have the for me completely new taste in my mouth. Such a long detail tutorial… looks really amazing.This kind of recipes are the ones I am looking for. Thank you for your sharing. These look lovely and very similar to other pastries I have eaten around the Middle East made with sheep’s cheese. Love the addition of currants. What a BEAUTIFUL dish! I love halloumi, ive bookmarked this recipe and cant wait to try it! Thanks! I have enjoyed your post so much; in Lebanese Christians traditions Easter is important too; perhaps not to the extend that it is in Greek or Cypriot traditions but nevertheless there are a lot of festivities and of course intense preparations of ma’moul, a semolina dough-based cookie, filled with pistachios or almonds or dates and shaped either like Christ’crown of thorns or like the sponge that was used to wipe his forehead. Or something like that. My mom would make them and ship them to me in the US, rain or shine.Love these Cypriot ones, as we in Lebanon, love Halloumi cheese and even make it locally. I love this recipe, I made it the other day for dinner for my friends. I added Stilton to the cheese mixture as its my favorite cheese. I get all my inspiration from the Stilton blog on the Stilton website: http://www.stiltoncheese.com/blogJust thought I’d tell you about my food ideas and inspiration thanks! Hey sorry but I have heard from some foodies that the link I posted above isn’t working for everyone. So try this link to the Stilton blog instead: http://bit.ly/bmsLUa cheers guys!